I get asked a lot about how to find companies and stocks to invest in. Where do you start? It’s a great question and also a very overwhelming question to people. They’ve setup the broker account. They put some money. They’re now ready to buy stocks. Where to start? 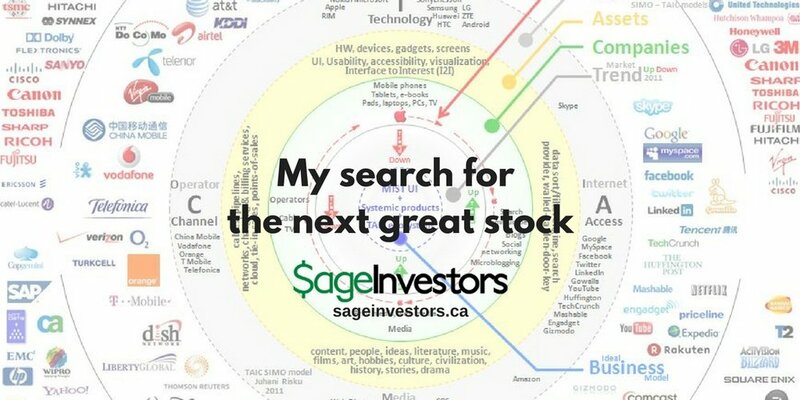 A few years ago I wrote a blog on how to find stocks to invest, where I suggested a simple and easy starting point in identifying companies to evaluate. The premise was identify the core necessities of life that we need on daily basis and find those stocks that offer that value proposition. The necessities of life are essentially food, clothing, shelter, and transportation (I may add another one communication). Identify the companies in each pillar and evaluate them to find the best run, best managed, best performing. These days, one of the prominent business thought leaders is Scott Galloway. He is a walking market research machine and can hit with you with so much data you’ll faint. If you want proof check out one if his presentations. “...Begin thinking of Uber as an OS. The most impressive firm of the nineties was the original gangster leveraging the operating system — Microsoft. The most influential firms of the last decade, the Four (Amazon, Apple, Facebook, and Google), have become operating systems for retail, media, connections, and information, respectively … and extract serious rents from the apps that sit on top of the OS. What firm has busted a move and blown through $100B market cap that isn’t effectively an OS? The latest, Netflix, has taken advantage of the extraordinarily lame cable industry and now occupies the second-most-important screen, the television. Netflix has increased its market cap 2400% in the last five years. It’s a pretty compelling argument and it made me wonder what other “OS’s” are out there in other industries? Then I thought about my pillars, food, clothing, shelter, transportation? Has anyone staked their claim as owning the OS for these pillars? Where would Google, Amazon, Facebook, Apple play in this? I thought it would an interesting exercise to carry out and may it can uncover some interesting investment opportunities. My search for the next great stock had begun. We live in a time where having the most market share does not necessarily translate into being the leader in the market. Market share is nice but if you can control the distribution channel in how products are accessed by customers, you can build a durable competitive advantage, which is something Warren Buffet loves. If you wanted to sell a product in a traditional retailer, you would need to go through the gatekeeper who would charge you a fee to get into their ecosystem. Traditionally that would have been a department store or some kind of physical retail store in a mall. This is changing. The distribution channel in the 21st century has become online. The Internet. The theory that Galloway offers is whoever can offer a compelling online platform/ecosystem/operating system will have a durable competitive advantage as consumers will stick to and out of convenience be loyal to an operating system and the stock market will put a premium on those companies that own the OS for a specific sector or industry. I set out to try to figure out who are or could potentially be the companies that will own the OS for Food, Clothing, Shelter, Transportation, and Communication. Ultimately I’m looking for the next great stock. I found the best way to get some semblance of an idea is to approach it from different perspectives. Who could be the OS of each pillar? Here's what I came up with it. The food space is where an epic battle is being fought. Amazon with the purchase of Whole Foods made it known that it was going to push hard into the grocery business. The Amazon Go store concept is another channel that can give them a runway. Walmart is not sitting idly by. Their move to partner with Google to give them access to Walmart’s inventory including grocery is a strong response. They've made it clear their target is not Target but Amazon and their partnership with JD.com has so far benefitted Walmart's online presence. Even JD.com has signalled they are willing to enter the US market to challenge Amazon. Traditional grocery chains like Safeway, Krogers are under threat. Costco has scale and a loyal customer base but their lack of significant online presence has been a common criticism. The appears to be changing though as Costco recently announced that they would be offering a home delivery service for groceries. Clothing and apparel is not as clear cut as the other pillars as there is a fashion component which is quite subjective and requires having a handle on people’s finicky tastes and consumer behaviour as well a pulse into current pop culture. In this group, I’m thinking there could be multiple OS’s, one for generic staple clothing (socks, underwear, t-shirts etc), one for sporting apparel, and another for higher-end luxury brand name goods. These companies are about offering customers value at a low cost. Because of their size and scale Walmart, Costco, and Amazon seem like a natural go-to platform to get these staple/utility like clothing products. The dominant sporting brands in the world are Nike and Adidas with Under Armour coming up fast. The reality is Nike is pretty dominant in the main sport apparel lines (outerwear, shoes, athletic training), so if they could build a platform where you customize the shoes, track pants, and hoodies, they could own the sports ecosystem/OS. The luxury space is built on exclusivity, brands, and aspirational tastes. It’s more niche oriented so it’s difficult for a niche brand to own the luxury ecosystem. The players that could potentially have a chance are the Louis Vuitton umbrella which owns tens of hundreds of luxury brands, along with traditional retailers such as Saks or Nordstrom. Nordstrom is interesting in that they are the most advanced in terms of building an OS. A significant portion of their sales is coming from online. The one potential player that could stake a claim to the luxury OS is Apple. Apple in itself is a luxury brand, selling devices that cater to a upper-income/high-income demographic. They’ve convinced people that paying $1000 for a phone is a good thing. Their ecosystem is well entrenched and has a very loyal following. Apple hasn’t made full inroad to selling goods beyond phones, watches, and computers, but it wouldn’t be hard because the components of their OS and their constiituents are right there in front of them. Like the clothing pillar, it’s hard to see one dominant brand owning the ecosystem on how we move around on a local basis as government has traditionally been the default owner of the local OS, even if players like Uber and Lyft are in the game. What’s more interesting is inter-city and world travel and Galloway took a bit of deep dive into a potential travel OS through the lense of Uber. From a travel perspective, there are several companies that have built very durable ecosystems in their area of specialization. As Galloway alludes to, there may need to be some hooking up with some of these ecosystems to create that dominant OS. Uber and to an extent Lyft have built a platform for local transportation. Expedia, Booking Holdings, and to an extent Google via Google Flights have platforms in the planes, trains and automobile booking side. Then there is the experiential side of travel, where again Expedia, Booking Holdings, as well as Trip Advisor, Air BnB, and Facebook/Instagram have become go-to platforms. There could be a very lucrative opportunity for some of these companies through aquiistion to position themselves as the OS of travel. Real estate has been always about data and location and this information has traditionally been concentrated at the real estate agent level. You had to go through an agent to buy or sell a home. That is no longer the case. In the US, companies like Zillow have capitalized on this and have become a player in the real estate ecosystem. In Canada the agent brokers continue to have a grasp on real estate information but that appears to be changing fast. So while the data is becoming more accessible, the OS is still in its infancy. One company that can shake that pretty fast is Google. They have the OS and they have the location technology via GPS. If they get the data, then look out. Google could easily become the OS for Real Estate. Traditionally the cable and satellite companies owned the media/entertainment ecosystem. They owned the distribution but not the content and it was a tough nut to crack. This has changed dramatically. Now the content owners are in charge thanks to the Internet. The more content you own, the better chance you can control the OS. We’re seeing the transition in real-time right now as companies like Disney, HBO and traditional networks strike out on their own and are distributing their high value content direct to consumers without a third party. Netflix has reinvented themselves numerous times and has survived because it realized it needed to generate its own content to survive. The problem with self-generating content is it is very hard to do consistently and at a high level. It’s also very expensive but Netflix has been committed to doing so because having high quality legacy content is very helpful as it creates a moat. Google which owns YouTube could be a player and is now aggressively developing online programming. Right now Disney with its ESPN, Star Wars, Pixar, Marvel, and Mickey Mouse movie franchises is the best positioned to own the Media OS. Apple could be said to own the music OS via its iTunes platform, however is far behind on the TV/Movie side but can catch up really fast with its $250 billion cash hoard to develop or buy a big player like a Netflix and/or Twitter. Even though Facebook says it’s not a media company, it is a media company when we layer over the events of 2016 on top of it. If it were to come clean with it, they could be a very dominant media company. Twitter has become the OS for live news programming and essentially the complimentary second screen providing real-time analysis and content. If they can monetize it, look out. I also tried to come at this from looking at the various voice recognition devices that are out there and see which devices (i.e. OS/Ecosystem) would be compatible with the Pillars. Amazon’s Alexa platform appears to be suitable with the Food and Clothing pillars to meet the day-to-day home needs. Google Home also appears to complement the Food and Clothing pillars but also there is potential to support Travel, Shelter, Media and Entertainment pillars as well. With Apple Home Pod ecosystem. right now it seems relegated to Entertainment, but potentially given demographics of its ecosystem could be a big player in the Luxury retail space and potentially the food space if it were to make monster acquisition such as Costco (dare to dream). Finally with Facebook being a media company it’s value could lie in supporting the Media and Entertainment spaces. I also looked at this from the perspective of income where a person’s income could influence what type of ecosystem they would consistently interact with. For low to middle income people gravitate more to the Amazon, Google or Walmart platforms. With Android the dominant mobile OS, an opportunity is there for Google to steer them into their ecosystem. Upper to high income earners are well entrenched in the Apple OS. They spend money so if Apple can broaden out its offering within its OS, it could really entrench itself and build a durable advantage. From this exercise, what jumped out was how much of a player Google can be in various sectors and beyond its bread and butter search if it builds a half decent platform. The conventional thinking has been Amazon disrupting and ruling the world. Far from it. This exercise is also based on what we see, but I'm sure there are organizations and people we haven't heard of who will also make their mark in trying to own an OS. I also would need to do a deeper dive into these companies as I wouldn’t just dump money into all of them. I also realize that this exercise has been North American centric. By no means can we assume that a platform that may work here North America would work in other parts of the world. There are also very worthy candidates like TenCent, Alibaba and Baidu that have the competencies and scale to challenge the companies I've highlighted. From this perspective, it seems we really are on the cusp of a major revolution in how business is done.